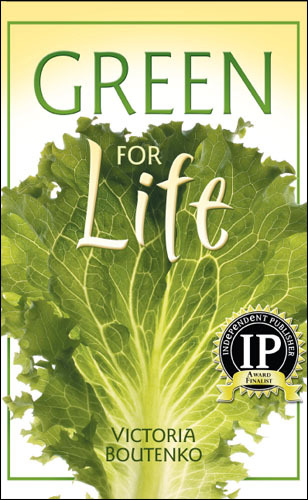 I received the book Green for Life by Victoria Boutenko as a birthday gift several years ago and it’s message lives on in my everyday rituals, in my personal training business and my general perspective on nourishment. I believe anyone interested in optimal health and weight-loss should read this book for an underlying knowledge base about nourishing the body, maintaining a healthy weight and restoring health. This amazing self-published book is a quick and easy read. Boutenko chronicles her own family’s transformation from sick and riddled with ailments to vibrant health through the use of green smoothies. What I appreciated about the book is the tremendous amount of research Boutenko did on the subject of green food. She began her exploration with extensive research about chimpanzees including traveling to zoos to observe them and their eating habits. She reveals some fascinating facts that have really reshaped my thinking about greens and protein. Greens are not vegetables, they are their own category and refer to leafs like kale, romaine lettuce, spinach, & even carrot tops. 25-50% of a chimpanzees diet is from green leafy food (Source: The Chimpanzees of Gombe by Jane Goodall, 1986). Chimpanzees never eat in the late afternoon or evening. Many testimonials from people who experienced remarkable health improvements from incorporating green smoothies. More than 20 green smoothie recipes that are simple and do not contain far-out ingredients. It’s not a sales pitch. There is nothing for sale in the book. I have made green smoothies daily in my Magic Bullet blender for the last several years and it is simply a part of my daily ritual (or I cheat with a green food powder supplement).